Batter's Box Interactive Magazine - Don't Raise A Stink! Raise A Banner! C's Rally Skunk Their Way To A Northwest League Title! Don't Raise A Stink! Raise A Banner! C's Rally Skunk Their Way To A Northwest League Title! 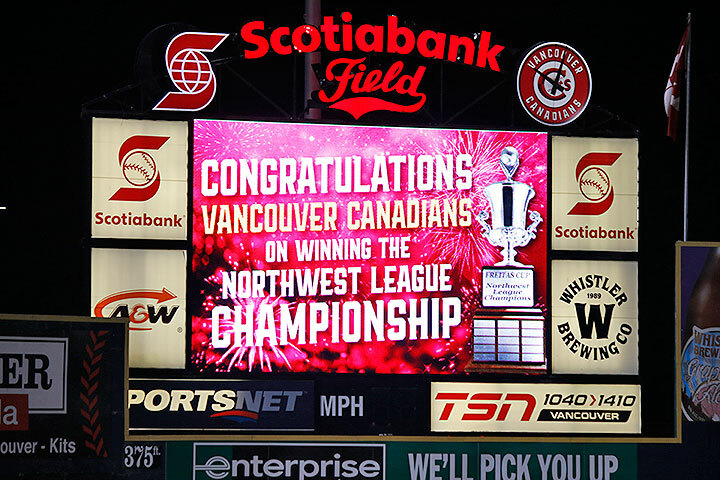 The Vancouver Canadians are the 2017 Northwest League champions after a 2-1 victory over the Eugene Emeralds in Game 4 at Nat Bailey Stadium. The C's have won four Northwest League titles since becoming an affiliate of the Toronto Blue Jays back in 2011. The C's managed to win the last two games of this series despite getting just five hits. Eugene starter Jose Alberto had a no-hitter into the fifth but Deiferson Barreto drew a one-out walk before Reggie Pruitt recorded Vancouver's first hit with an infield single to short. Chavez Young moved both runners up by grounding out to second before Logan Warmoth got one past the infield with an opposite field single to right to score Barreto and Pruitt. Pitching and defence won this championship for the C's. Justin Dillon managed to escape a one-out bases loaded jam in the first inning, striking out the side in his first two frames on the way to seven K's over three frames. Zach Logue gave up a leadoff homer to Michael Cruz in the fourth and the Emeralds tried to get another run in the fifth but left fielder Norberto Obeso threw out Jose Gonzalez at the plate trying to score from second on a Zach Davies single. Logue got through the sixth, striking out four over three innings to earn the victory. White Rock, BC native Brayden Bouchey used his curveball to great effect with two perfect frames, striking out three. Bouchey overcame a dropped pop-up to the first hitter he faced when catcher Riley Adams and first baseman Kacy Clemens bumped into each other. Clemens had the better angle as Adams was backing up but Adams had a bead on it and was about to make the catch before Clemens bumped into him. They were upset at each other for failing to get the out but Bouchey picked up his teammates by getting Miguel Amaya to line out to center on the next pitch. The Northwest League All-Star duo of Orlando Pascual and William Ouellette finished up the ninth. Pascual struck out the first man he faced before Young ran one down in foul territory in right field. His momentum caused him to tumble over the short wall but he held on to the baseball to record the second out. Ouellette rung up Will Remillard to start the celebration. In total, the C's hurlers whiffed 16 Emeralds while allowing just four hits and three walks. Congratulations to the C's organization for winning the Northwest League title and bringing the Bob Freitas Trophy home. Vancouver joins Dunedin in the winner's circle after the D-Jays captured a share of the Florida State League championship. That concludes the minor league updates on Batter's Box for 2017. Stay tuned for the Blue Jays Top 30 prospect rundown. Thanks for reading! Posted by #2JBrumfield on Wednesday, September 13 2017 @ 03:32 AM EDT. Thank you #2 Brumfield, Gerry, Sam and anybody else who did the minor league recaps this year. It is very much appreciated. Thanks for all the thought provoking insights and hard work by the staff. Also to every Bauxite for their opinions and analysis. yep - the in person milb reports are the heart of this site. great stuff all year. Agreed with all of the above, thanks! and I'm sad to see the minor league updates concluding. Looking forward to the top 30 - it should be an exciting list. Yes, thank you to all of the MLU writers. I felt the new format worked well and added to the easily accessible information now available online. Excellent work everyone. Love reading these every year. Thanks for the kind words, folks! Much appreciated. For more on last night's clincher in YVR, click here. Great job for everyone who did the minor league coverage this year. Thanks to the entire MiLB crew for the reports/updates throughout the season - much appreciated! #2JB - Excellent work by DaBox team! Appreciated work. Bravo! I added the Jays to my Expos when I saw the early 80's green shoots in the minors. As the shoots grew, and new ones emerged, I was hooked. Still am. The minors are the heartbeat of the next decade's team. This year we have a very strong heartbeat! asked if a player that we wouldn't know who might be a surprise, he mentioned Graham Spraker, who pitched well in playoffs after being brought up from Bluefield: said he has a big league arm as well as grit and determination. I listened to that interview too. Bryan Lizardo. V young, DOB July 26,1997, 3B, switch hitter. Miller said that we have to wait for him. Good power from both sides. I have always thought Lizardo might be a sleeper prospect but so far he has disappointed. He is still very young and there is time. As Miller pointed out, he is learning to switch hit. This is something we don't see in a stat line. Urena was working on improving from the right side as well in NH, which explains to some extent his lower BA. We have to be careful making major league projections (or any projections) from minor league stat lines as there is a lot of stuff going on that we don't know. Congrats to the C's and a big thank you to the guys who do these milb updates. Wonderful stuff! Thanks, not just for the milb updates, but the overall effort put forth keeping this website up and running. I've seen a lot of Lizardo in the past two years. At 20, he isn't that young anymore for the level (he's obviously not old either) and he really can't hit. I actually think there's a non zero chance he gets released in the offseason. Otherwise, he'll be back for a third season in Vancouver. He has made himself into a competent defender at 3B though. Have to say my thanks to those who keep up the minor league thread. It's part of my daily reading. Also a big thanks to everyone who helps maintain this site. Is there any word on when/if/where instructional league will commence. The last I heard was that the start had been postponed for a week. I am trying to work on my 11-20 prospect list. It is very difficult. But I want to do it my way. My rules/guidelines. H Danner IMO is a better pitching prospect. As a catcher I will give him time, not the high ranking #9 on 1 list I follow. So maybe 17-19, with E Pardinho 2 spots higher. Pardinho is very young, but can touch 95. Jaun Meza is also a power arm, but not on my list at all. I was wondering what the guidelines are for prospect qualification. Age 25? #IP or ABs in the Majors. in general age 24 is as high as i like going in calling someone a "prospect". and even then they better be doing very well in AAA at that point. Tammy Rainey just wrote a prospect review on the local BP. can't link to anything on my phone anymore apparently. I've only glanced, but I think the Aaa and Aa catcher assignment predictions are off. For one, Jansen clearly has earned AAA starting spot, and while McGuire got jumped, he also needs full-time. If Jansen isn't performing then you have a straight out competition later in the season. I think more logically, you have McGuire and Pentecost in AA. McGuire getting the call to replace anyone in AAA and maybe replacing Jansen or whoever else gets called up more permanently if the mlb backup doesn't perform. Pentecost probably still gets babied a while but can expand into more time later. I think that these assignments will be decided in ST. I realize people may be getting tired of all the Nick Sinay hype, but here's Jeff Sullivan with yet another story on the Lansing Lugnut's peerless prospect. The Jays have fired the Vancouver Canadians manager, Rich Miller, after he lead them to the league championship. Wonder what he did wrong ? Any reason why Naswell Paulino wasn't invited to Instructional league? I know he is recently converted to pitching but that would suggest that instructional league would be helpful? I guess he will start next season in the DSL again. Has it been noted that Geno Encina was released in early September.